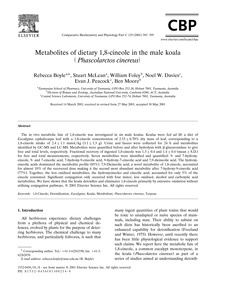 The in vivo metabolic fate of 1,8-cineole was investigated in six male koalas. Koalas were fed ad lib a diet of Eucalyptus cephalocarpa leaf with a 1,8-cineole concentration of 2.53 ± 0.70% dry mass of leaf, corresponding to a 1,8-cineole intake of 2.4 ± 1.1 mmol/kg (3.1 ± 1.3 g). Urine and faeces were collected for 24 h and metabolites identified by GC-MS and LC-MS. Metabolites were quantified before and after hydrolysis with β-glucuronidase to give free and total levels, respectively. Fractional recovery of ingested 1,8-cineole was 1.3 ± 0.4 and 1.4 ± 0.4 (mean ± S.D.) for free and total measurements, respectively. Seven metabolites were identified and quantified: 9- and 7-hydroxycineole, 9- and 7-cineolic acid, 7-hydroxy-9-cineolic acid, 9-hydroxy-7-cineolic acid and 7,9-dicineolic acid. The hydroxycineolic acids dominated the metabolite profile (85%). 7,9-Dicineolic acid, a novel metabolite of 1,8-cineole, accounted for almost 10% of the recovered dose making it the second most abundant metabolite after 7-hydroxy-9-cineolic acid (77%). Together, the less oxidised metabolites, the hydroxycineoles and cineolic acid, accounted for only 5% of the cineole consumed. Significant conjugation only occurred with four minor, less oxidised, alcohol and carboxylic acid metabolites. We have shown that the koala detoxifies and eliminates 1,8-cineole primarily by extensive oxidation without utilising conjugation pathways. © 2001 Elsevier Science Inc. All rights reserved.